Then check out our NEW eBook! 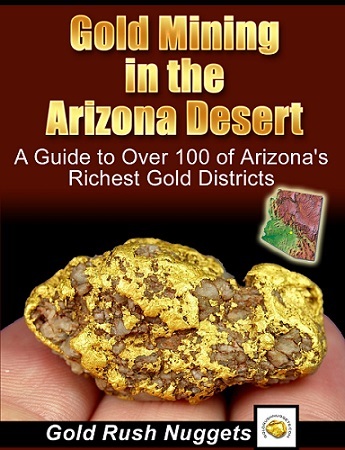 Gold Mining in the Arizona Desert - A Guide to over 100 of Arizona's Richest Gold Districts is a 90-page printable PDF report jam packed with documented locations where gold has been found within the state! It includes an extensive look at some of the well-known gold bearing areas in Yavapai, Mohave, Cochise, Yuma, and Maricopa Counties, along with many of the lesser-known areas as well. It is filled with creeks, rivers, washes, gulleys, and mines that have all produced gold in the past, and will lead you to places that still hold potential for gold today! Over 100 gold districts are covered in this eBook! A detailed breakdown of gold bearing areas in Arizona, broken down by county and gold district. 10 "Quick-Tips" to help you in your search for gold! 30-day Guarantee! 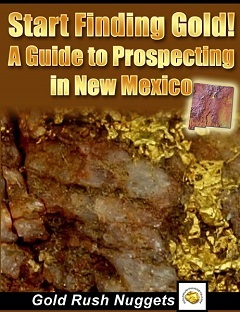 We know that this guide will help you find areas to prospect for gold in Arizona. If for any reason you are not satisfied, we will gladly give a full refund. We offer this 30-day guarantee because we know that this eBook will help you find some great places to look for gold! Gold Mining in the Arizona Desert - our 90-page eBook about where to finding gold in Arizona. 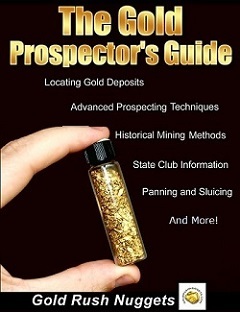 The Gold Prospector's Guide - this 65-page eBook covers historic mining methods, basic and advanced prospecting techniques, how to located gold deposits, information about prospecting clubs throughout the U.S., and much more! 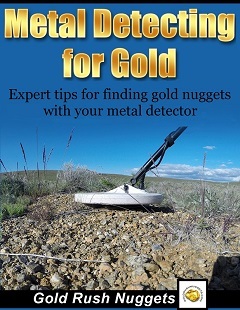 Metal Detecting for Gold - this 68-page eBook covers in detail the different types of gold detectors, research tips for locating gold nuggets, how to properly setup and use your gold detector, important gear and accessories to own, target recovery tips, and much more! Metal detectors are one of the best ways to find gold in Arizona! Gold Mining in the Arizona Desert - 90-page eBook that covers 100 known gold districts in the state of Arizona. 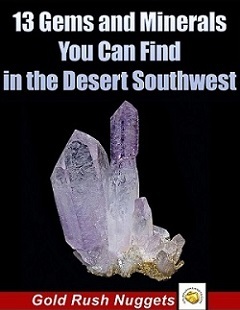 Many California prospectors venture over to Arizona to find gold, as it is one of the best gold mining states in the U.S.
*The Gold Mining in the Arizona Desert eBook will automatically be emailed to you as a printable PDF after purchase. No waiting and no shipping charges. 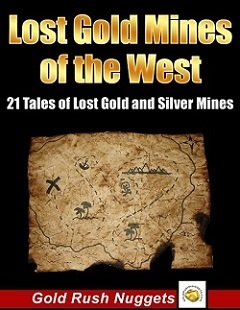 *This eBook has many documented locations where gold has been found in the Arizona. Please understand that many of these places may currently be on private lands, active mining areas, Indian Reservations or within areas of special regulations. It is the readers responsibility to ensure that they are in an area open to prospecting. This content of this eBook is for informational purposes only.